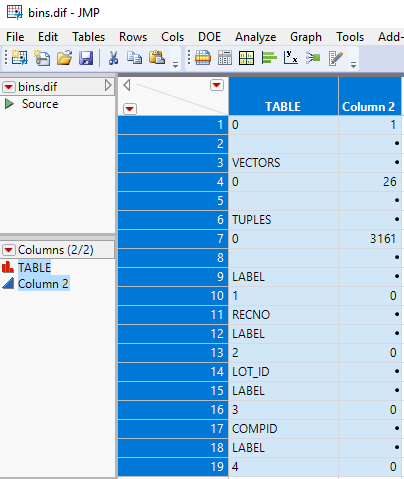 I am trying to import a .dif text file into a JMP data table. When I use the file import, I have the option of using Excel to open it, or "Data with Preview". If I were to write a script to use Excel to open it, how do I get the same script to put the excel worksheet into a JMP table for further use. 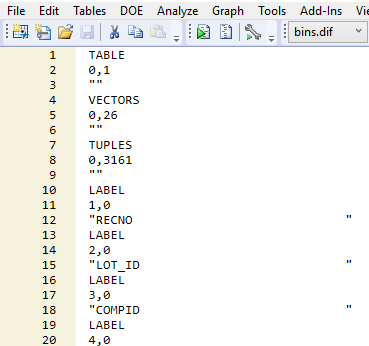 Is there a way for JMP to open .dif files directly in the same table structure that Excel creates? Maybe you could parse it if you read it in as plain text? I'm not sure what the file contents look like in a dif file. Attached are what the file looks like if I try to open it in Plain text format and with "Data Using Text Import Preferences"
I created an add-in to import data interchange format (DIF). Have a look and let me know if this will work for your files.